1For centres with mixed aged groups, the ratio is 1:8 and the maximum group size is 16 for children 60 months of age. At centres with separate age groups, this ratio is 1:10 and the maximum group size is 20 for this age group. In some provinces an age may fall into more than one age range. The ratios in this table represent a choice of the older age range in these cases. Source: CICH table created using data adapted from Friendly, M., Grady, B., Macdonald, L., & Forer, B. (2015). Early childhood education and care in Canada 2014. Retrieved from http://www.childcarecanada.org/publications/ecec-canada/16/03/early-childhood-education-and-care-canada-2014 – accessed July 24, 2017. Children under 6 in full-day child care that is centre-based will find themselves in different group sizes, with varying numbers of staff depending on their province or territory. For example, in British Columbia the group size for full-day, centre-based care for children under one year is 12 – with 1 staff member for 4 infants. In Newfoundland & Labrador, Prince Edward Island, Saskatchewan, the Northwest Territories and Nunavut the group size is 6 with 1 staff member for 3 infants. For older children (5 years) the group sizes range from 16 in the Yukon to 30 in Nova Scotia. 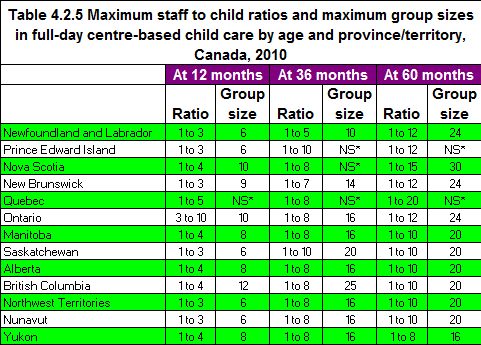 The staff ratios for older children range from 1 to 8 children in the Yukon to 1 to 20 children in Quebec.